One day on the train I started thinking about the reasons in favour of and against stockpiling food at home. 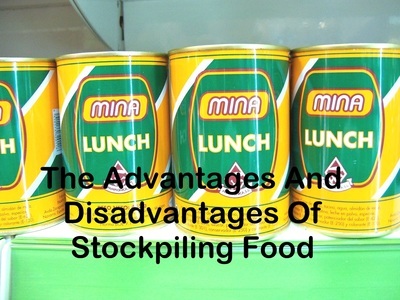 Different people probably have varying definitions of how much they feel a stockpile is. For some it would be a reserve of enough food to feed the family for a fortnight. Others might limit their stockpile to items bought in bulk, home preserved fruits or freeze home grown vegetables as a means of saving money. Your motive for thinking about having extra food on hand will influence what you consider as advantages and disadvantages. If you want a safety net in case of a temporary drop in income you may feel it is better to have some money stashed away to buy groceries. That way you do not need to keep an eye on the age of items and use some up and replace them. You do not need to worry about storage space. can save you money if you buy extra items when they are on special or buy in bulk. may need to buy a freezer to store frozen goods and this may be a considerable financial outlay. It costs money to run a freezer. Are you saving money? you have to find a space which is dry and protected from excessive heat to store packet and tinned goods. Successful stockpiling requires careful planning and keeping track of what you have. It can help you through a difficult time. Even if you don't want to have a substantial amount of food in reserve 'just in case' or as a money saving strategy, a few extra non perishable items can come in very handy.